ISCO-EFR® is EcoVac Services’ patented technology combining MPE/DPE (EFR®) with in-situ chemical oxidation (ISCO). This process targets sites with groundwater contamination from dissolved chlorinated or non-chlorinated (e.g. petroleum hydrocarbon) compounds. EcoVac Services works closely with FMC Corporation to develop a site-specific approach on a case-by-case basis. EcoVac’s EFR® technology is used to test the site prior to injection to determine the optimal injection well spacing for injection of activated persulfate or hydrogen peroxide solutions (Fenton type reactions). EFR® is used to create vacuum and hydraulic gradients and removes aquifer liquids prior to injection of the chemical oxidant. The ISCO-EFR® approach does not create plume displacement that is common with any type of subsurface injection. The ISCO-EFR® process facilitates maximum distribution of chemical oxidant under controlled conditions and creates effective contact of chemical oxidants with contaminant molecules, essential for effective remediation. 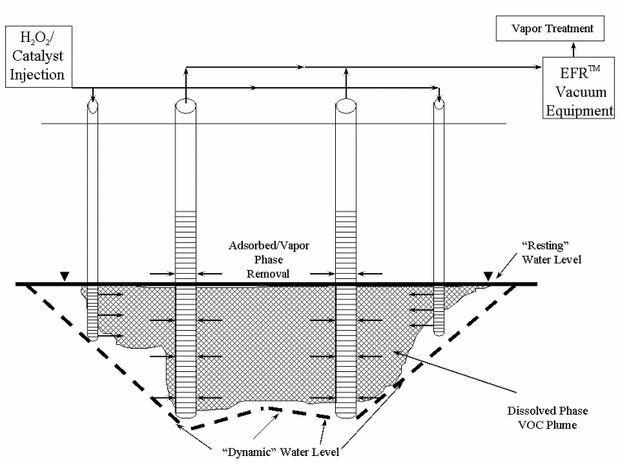 This approach captures fugitive vapors while also reducing the chance of rebound of dissolved phase groundwater concentrations. High pressure injection or direct-push injection points, which can lead to undesired displacement of dissolved or vapor phase contaminants, are not components of our ISCO-EFR® technology.